Welcome to our blog! We love our residents and want to highlight what makes them awesome. This is the first installment in our series featuring the wonderful residents of Hygge. This may be unconventional, but first on our list is our four-legged friend Smokey. Smokey is the cutest little nugget there ever was—there’s no denying it. Just look at him waiting for visitors. His little belly is as robust and as soft as it looks. If you get the chance to pet him, cherish it. You never hear him bark, just the occasional pitter patter of his small feet trotting down the Hygge corridors. Smokey is a 6-year-old Miniature Schnauzer, but he’s also an old man trapped in a dog’s body. Maybe that’s why he doesn’t love me as much as I love him. Big age differences are hard I guess. Most days you can find me following around Smokey trying to coax him into loving me. It looks a little something like this. If we had a relationship status on Facebook it would be “It’s Complicated.” Some days he loves me. Some days he avoids me. Quit playing games with my heart, Smokey. Let me love you. Anyway, enough about my unrequited love for Smokey. He has human caretakers that we love too. Marcie and Marty own Kelso Communications, a full-service marketing and advertising firm headquartered out of the space. At Hygge we treat our fluffy residents with as much respect as our human ones. Smokey is a member of the family, so give him a good belly rub when you get the chance. And if you couldn’t tell already, Hygge is a pet-friendly establishment. 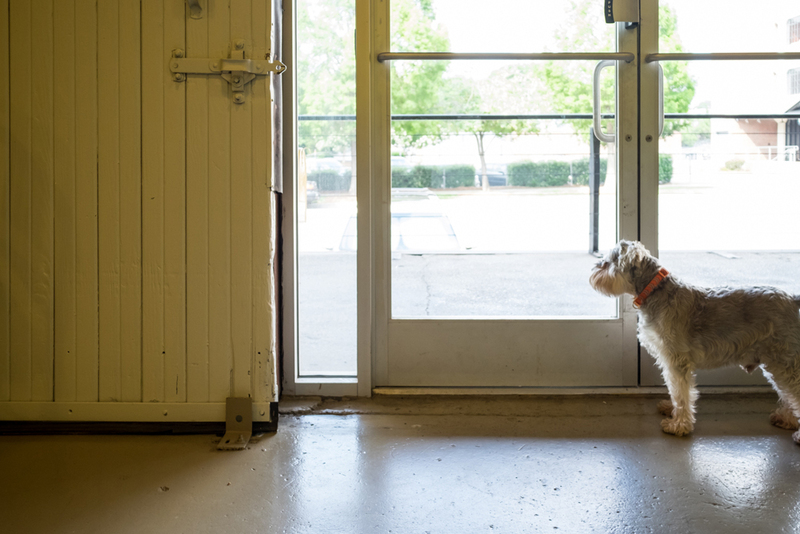 As long as your furry counterparts are well-behaved and friendly, bring them in! Why Was the Mayor of Charlotte at Hygge? Bringing People Together. Meet Kia!